"Oh, I have a pocket full of mouse melons!" …one of those things you never thought you’d say until you did. (The story behind this is: I spent a couple of hours this weekend beginning to work through the absolute jungle that is my former vegetable garden (since operations have now moved to the community garden). Along the way, I found a treasure trove of small onions (mostly “Egyptian” or walking onions, with I think a few shallots thrown in) and, so as not to waste them, pulled them up, and then spent HOURS skinning them and cutting up the greens, but now I have pork stew with onions we are just about to eat when I finish typing this, and a gallon freezer bag full of onion greens for the winter. 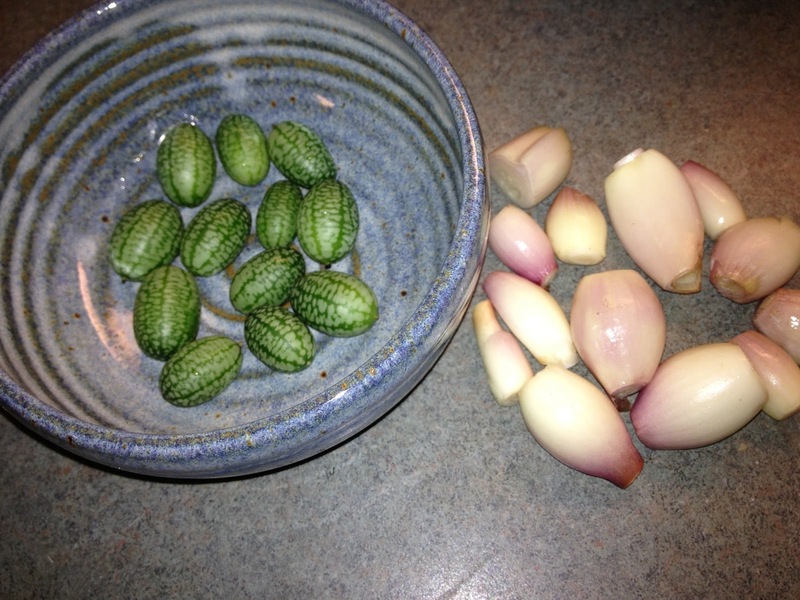 I also discovered a few mouse melon (or Mexican sour gherkin) plants that grew from last year’s fallen seeds (from plants that grew from the previous year’s fallen seeds), struggling along amid the weeds, with some fruit, which I stuck in my pocket for safekeeping and then forgot about.